BOM Block 6 is posted! A few years ago I bought several CD's on Ebay that contained scanned images of old blocks from vintage newspapers -- the the Kansas City Star -- and other newspapers and magazines. Someone had gone to a huge amount of trouble to scan and edit all those old clipping. In addition there were a number of catalogs and booklets with designs which could be mail ordered. I was thumbing through one of these called The Farm Journal and found some interesting blocks. Now I digress for a moment because I remember growing up and seeing The Farm Journal in our house. My dad, a fruit farmer in northern Ohio for many years, used to get The Farm Journal. And I recall that they had quilt and embroidery patterns for women "back in the day." This was a catalog which both contained some patterns and then offered others for sale by mail order. I believe this was from the late 20's or early 30's but perhaps some of my readers may be able to help pin down the date better. Check out this blog for a clue to the date. Block 6 of the Vintage Sampler is the Purple Posey. But as you can see it looks a great deal like this Prairie Rose block from the Farm Journal Magazine. The Farm Jornal called this a May Apple, but doesn't it look remarkably like Block 5 - All Thumbs? Clearly, the quilter who made this block for This Old Quilt had to have the May Apple block in mind! Oh, there is more!! This is the June Lily and it looks a whole lot like the block I am calling Blonde Tulips. The stem and leaves look remarkably similar and the flowers are much the same. Only the small set of upper leaves on the central stem is missing. I have read that some of these patterns are not really paper patterns at all, but actual fabric blocks. 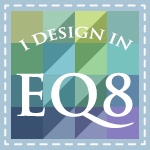 They were made and distributed as patterns and many of them found their way into quilts. But they were made up from a master pattern and sold as "patterns" to guide the quiltmaker. Wow do we ever have it easy today. This is the Rose of Sharon block and strangely, I used the same name for it when I drew the block. Uncanny how it resembles it, complete with the little buds in the corners. This Tiger Lily applique block is very similar to this block I am calling Tulips. 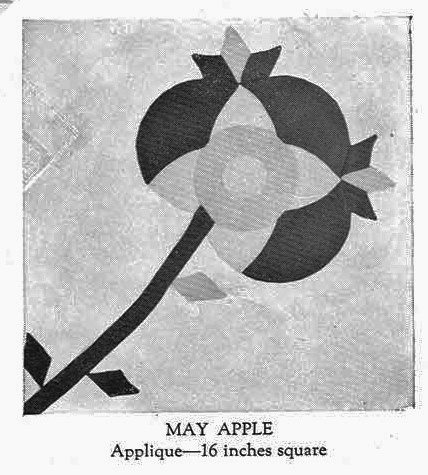 But it might not be tulips after all if we believe this old illustration! Don't you just love how the patterns have evolved in the hands of quilters? The new block I have drawn (on the right, above) is an exact duplication of the one in This Old Quilt, which likely dates from the same time as these old pattern illustrations. Yet each quilter made them uniquely her own. The next one is the closest of them all. It is a practically identical verion of the Tulip Crossing block. It is called the Tulip Circle in The Farm Journal. Scarey, huh? WOW! When I discovered these pictures I was so excited and couldn't wait to share them with you. Now I am motivated to go digging some more to see if I can find some more old blocks that could have been models for This Old Quilt. This old Poppy Block is quite similar to the one in This Old Quilt. 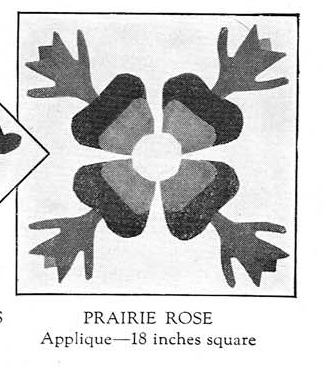 It was one of the few patterns in color in the Farm Journal pattern book. I expect that these pattern were fairly popular at the time and widely shared from quilter to quilter. The last block I found is called the Rose Wreath, and it shares a lot of similarities with this rosey wreath in This Old Quilt. No not exact, but those funny blue blobs look alot like the three buds that appear on this old drawing. 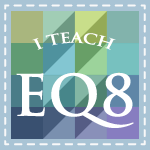 I can see how the quilter simplified the block and made their own hand-made templates. Not being a good artist clearly did not deter the quilter who made this Rosey Wreath block (on the right, below). Ahhh, it was so fun to discover these. I hope you enjoyed seeing the similarities between thes old Farm Journal magazine blocks and the blocks in Vintage Sampler. I will post more if I find them. Always on the trail of a mystery. Reese - I can't help you date the magazine but I sure did enjoy reading your post and drooling at the designs. Thanks for taking the time to share. You are so welcome Karen. 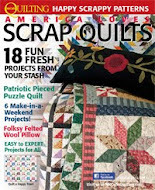 I recently found a blog that reported on the Farm Journal quilt patterns which indicated that the magazine carried quilt patterns annually between 1921 and 1947. And I found that they were selling catalogs of block patterns throught the 1930's, as were Sears, Wards, and the Ladies Art Co. among others. I will keep looking and post information as I find it. Thanks for your comment. Reeze, I have a big notebook of original Kansas City Star and a few other newspapers that printed patterns and they all have dates on them. My Mom saved them in a box and when she cut them out, she left the dates on the top. Unfortunately, they are back home in Illinois. I will be returning home in a couple of weeks where I can get it out and help with dates for you. Oh Gypsy that is so generous of you. What a treasure you have in the clipping notebook. If you find any information about these blocks I would love to see it and share it with my readers. Thank you so much for your kind offer. Thanks for all the fun information. I love learning about old quilts. You are so welcome Chris. Isn't it fun. It is a wonderful link to the past and the work our mothers and grandmothers did to create beauty in what was often a bleak world. Thanks for sharing your comment. Just a little over the edge. . .